An excellent, Royal Worcester porcelain "star" cabinet plate, with heavily gilded shaped and gadrooned edge and superbly painted fruit on a mossy background by Thomas Lockyer. 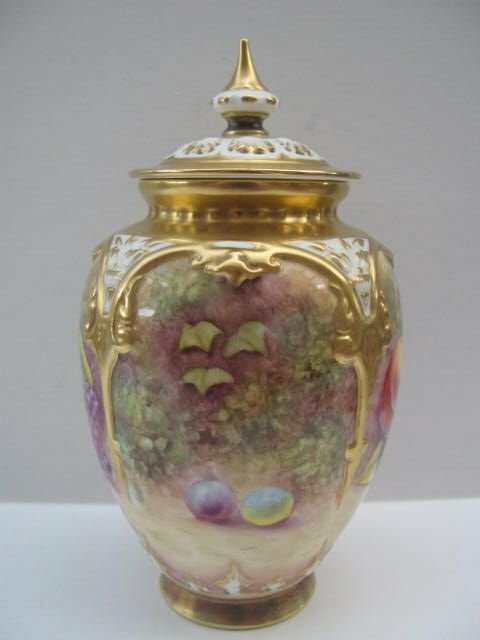 Standing approximately 8.3/4"diameter x 1"deep, it has the puce factory stamp for 1925 and is in excellent condition with no damage, crazing or restoration and the gilding is without losses or rubbing. 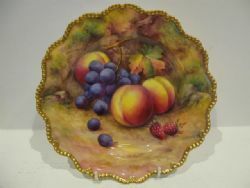 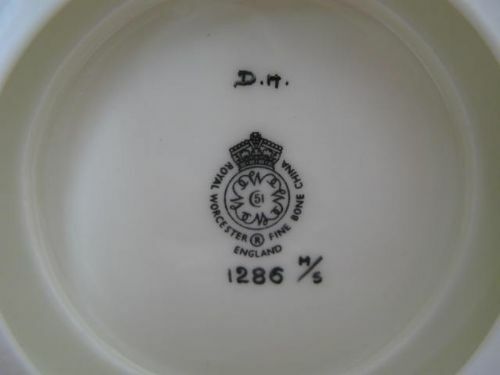 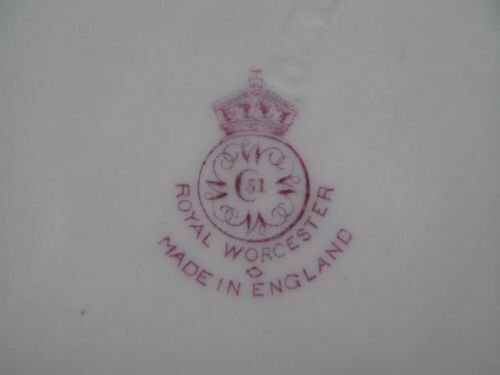 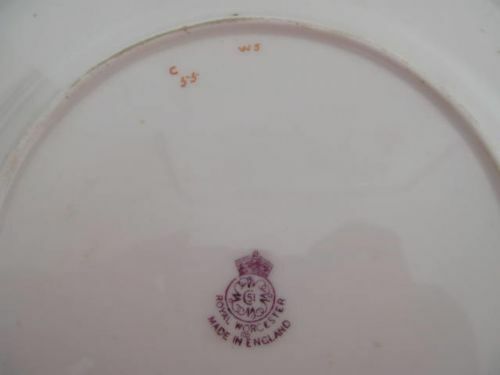 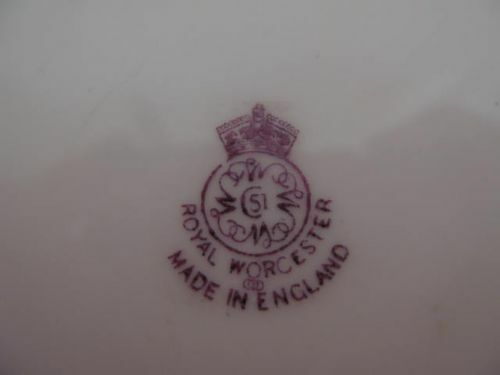 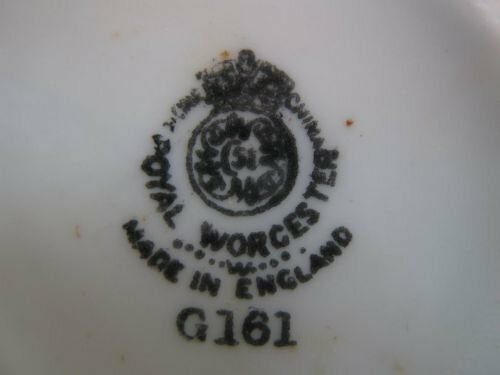 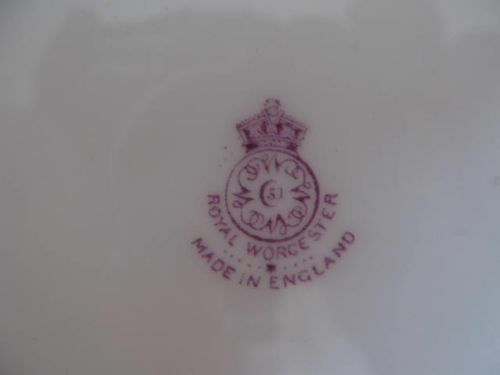 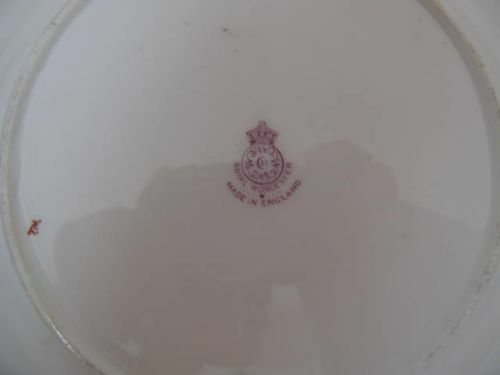 A Royal Worcester Fruit Painted Plate By T.Lockyer. An excellent, Royal Worcester porcelain "star" cabinet plate, with heavily gilded shaped rim and very well painted fruit decoration by Thomas Lockyer. 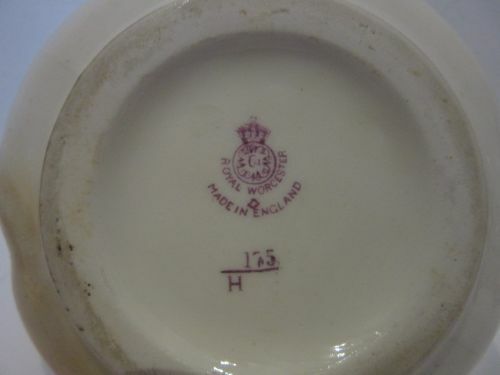 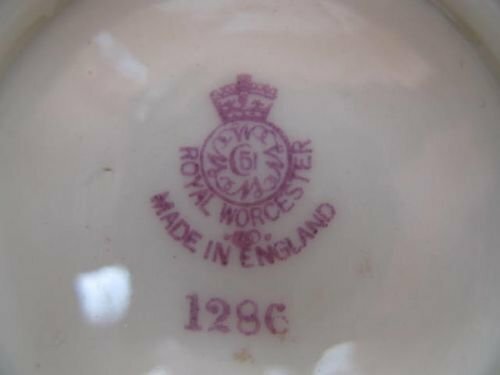 Standing approximately 8.3/4"diameter x 1"deep, it has the puce factory stamp for 1932 and is in lovely condition with no damage, crazing or restoration and the gilding is without losses or rubbing. 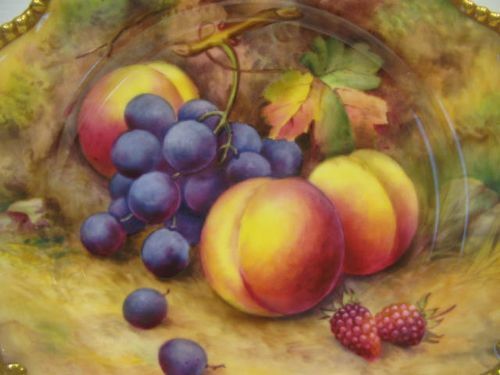 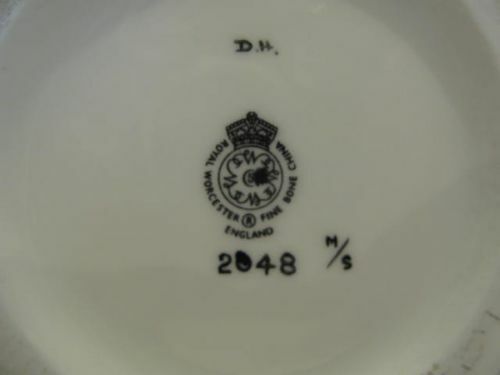 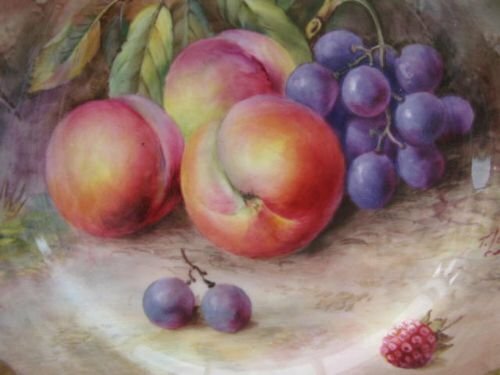 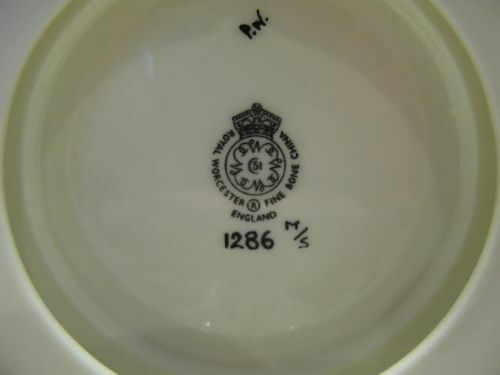 A Royal Worcester Fruit Painted Plate By Thomas Lockyer. 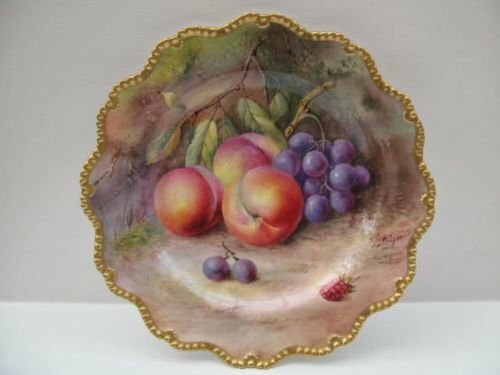 A good, Royal Worcester porcelain cabinet plate with heavily gilded, shaped and gadrooned edge, and very well painted fruit decoration by Thomas Lockyer. 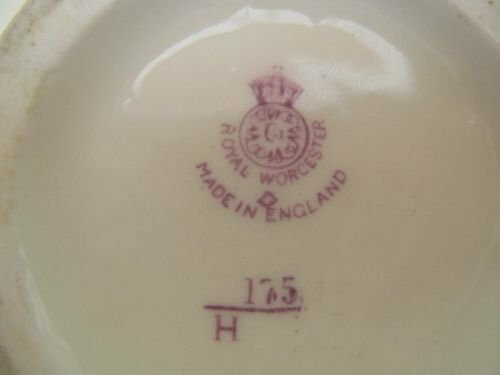 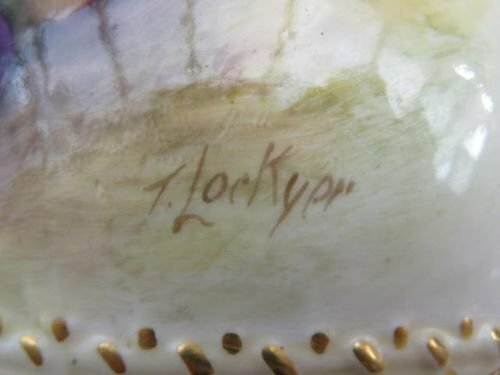 Measuring approximately 8.3/4" maximum diameter with puce factory stamp for 1929, it is in excellent condition with no damage, crazing or restoration, and the gilding is fresh and unworn. 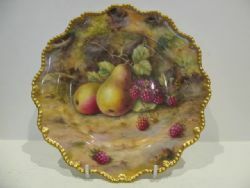 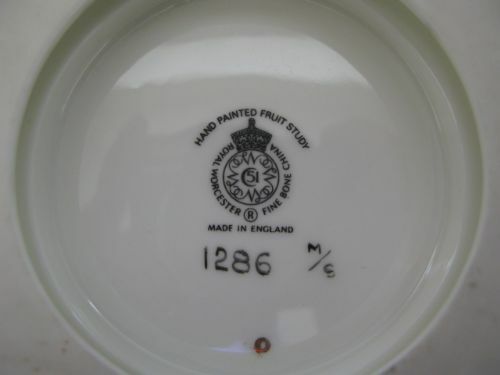 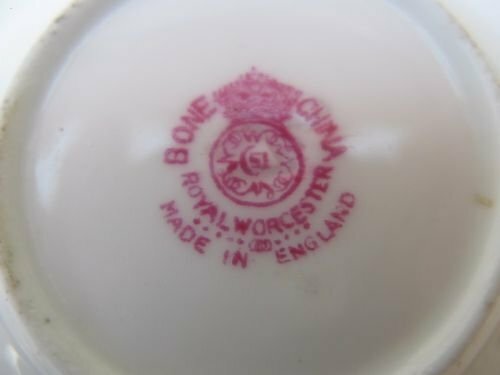 A Royal Worcester Fruit Painted Porcelain Pin Dish. 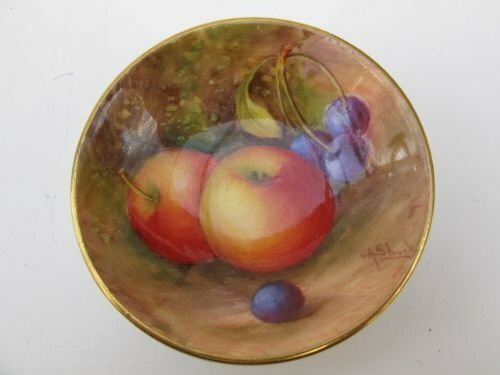 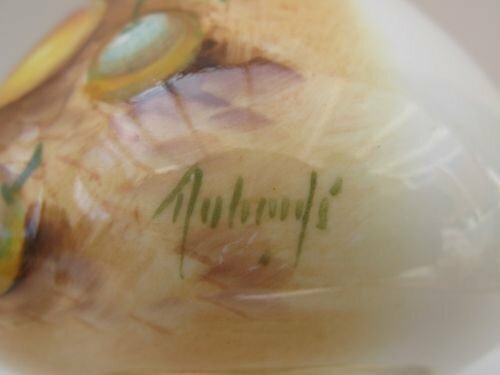 A Royal Worcester porcelain pin dish with well painted fruit decoration by Albert Shuck. 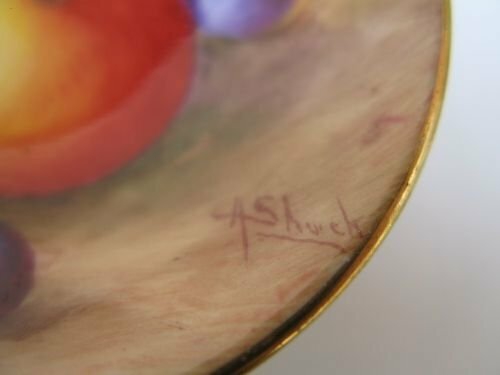 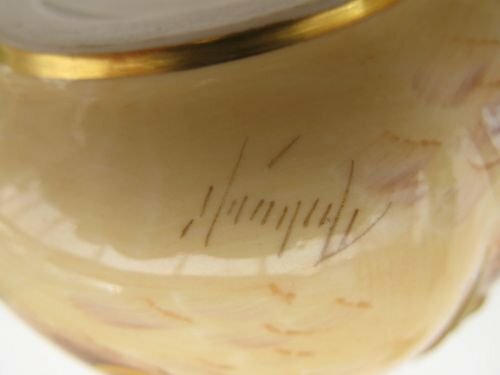 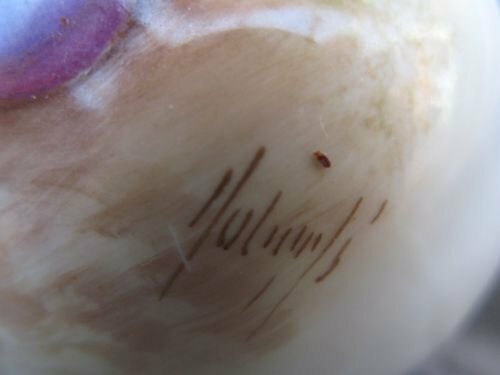 With puce factory code for 1941, it measures 3" in diameter and is in excellent condition with no wear to the gilding, repair or restoration. 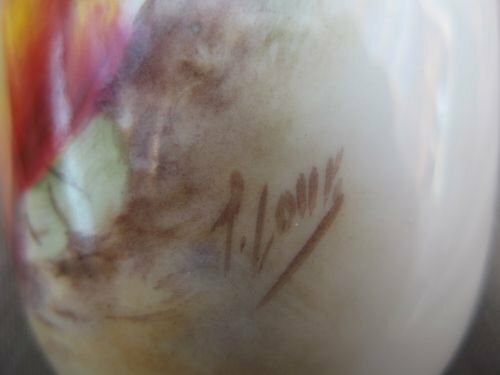 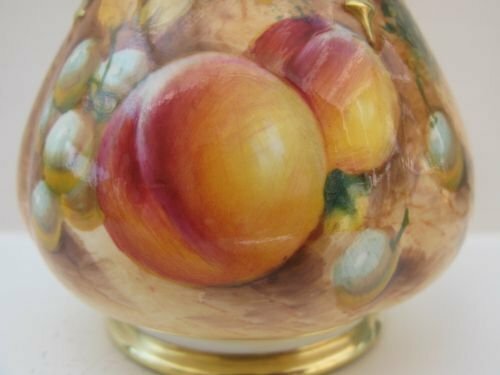 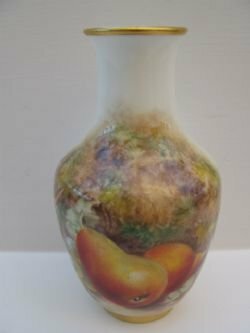 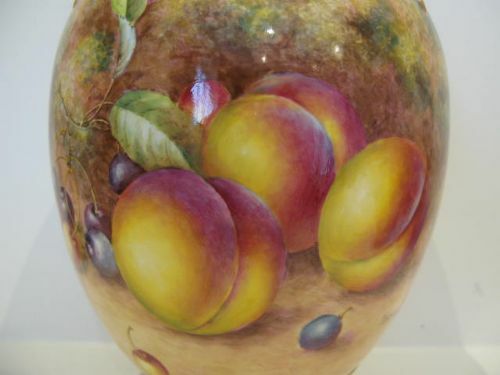 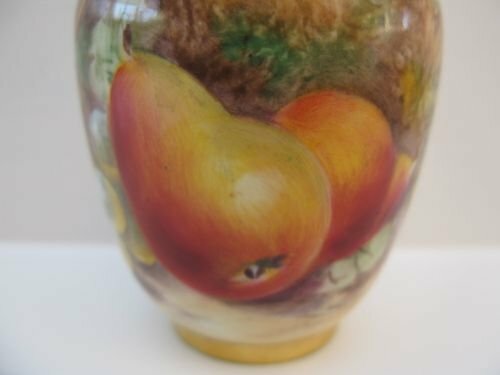 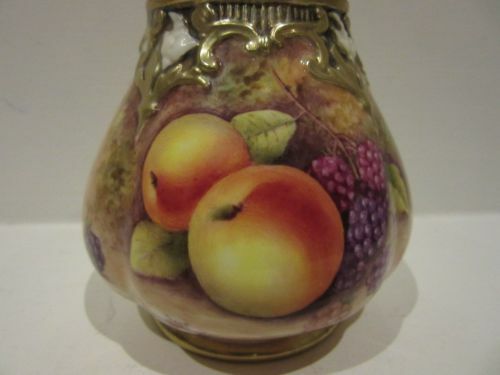 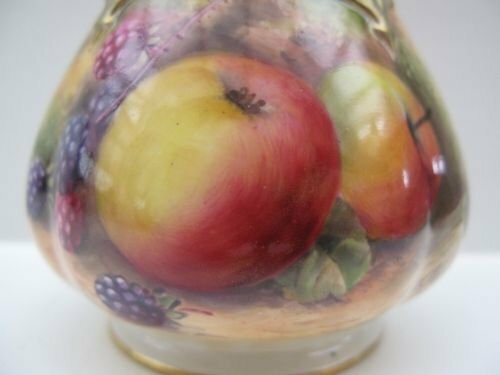 A Royal Worcester Fruit Painted Porcelain Vase By P. Love. 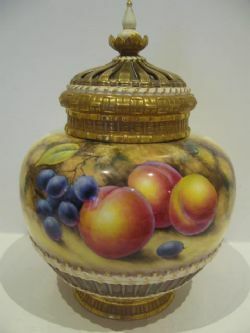 A small, Royal Worcester fruit painted porcelain vase, shape number 2491, with fruit painted decoration by Peter Love. 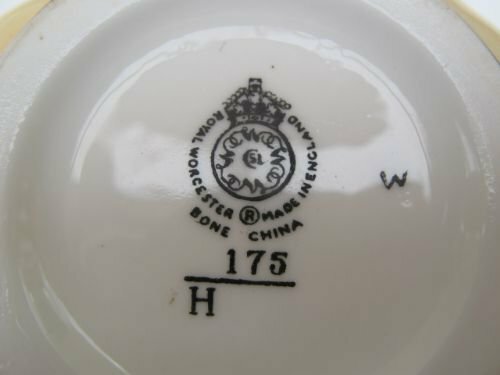 Standing approximately 4.1/2"tall x 2.5/8"maximum diameter, it has the black factory stamp for 1957 and is in excellent condition with no damage, crazing or restoration, and the gilding is fresh and unworn. 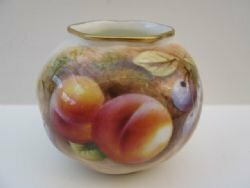 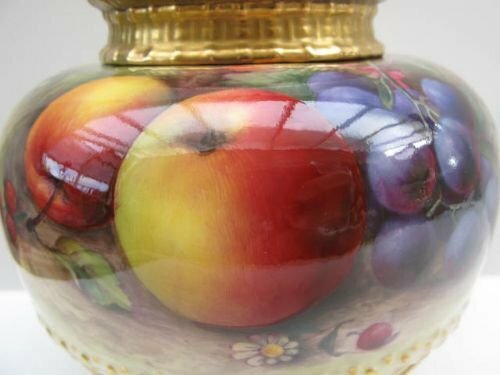 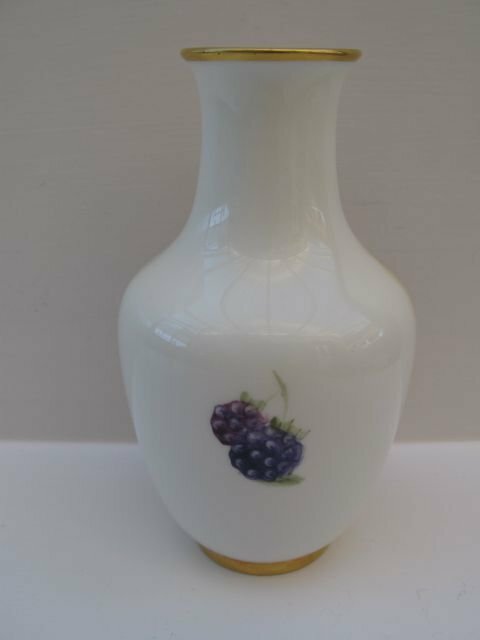 A Royal Worcester Fruit Painted Porcelain Vase. 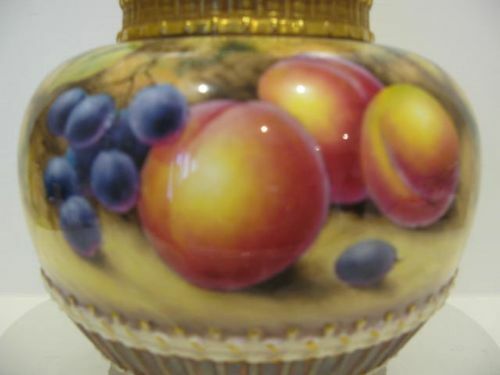 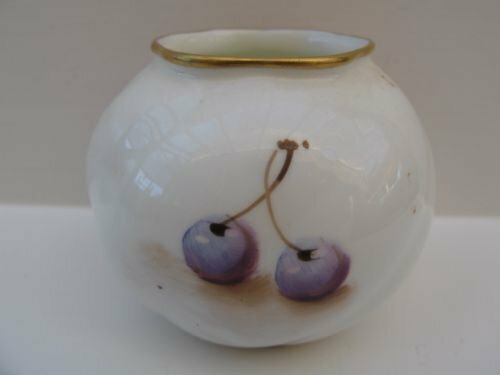 A small, Royal Worcester porcelain vase, shape number G161, with fruit painted decoration by William Roberts. 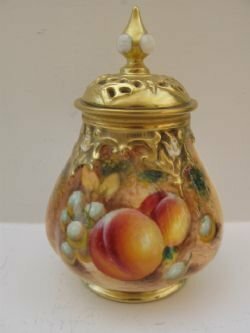 Standing approximately 2.5/8"tall x 3"diameter, it has the black factory stamp for 1960 and is in excellent condition with no damage, crazing or restoration, and the gilding is fresh and unworn. 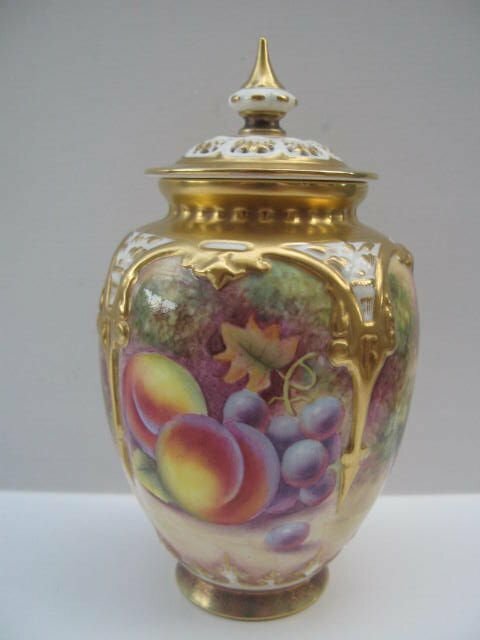 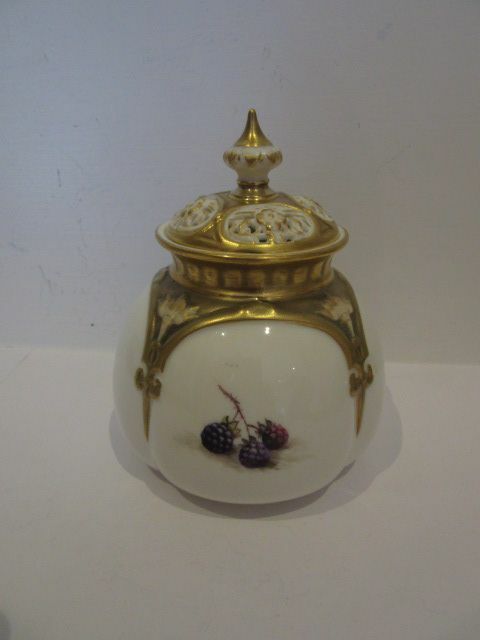 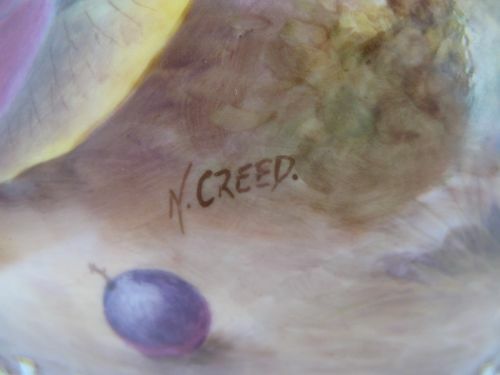 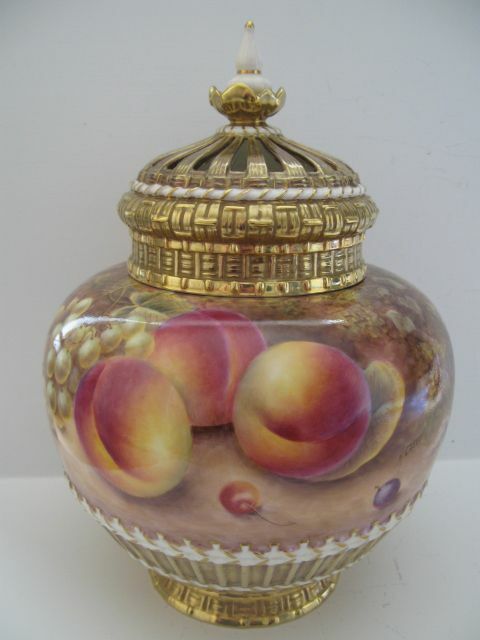 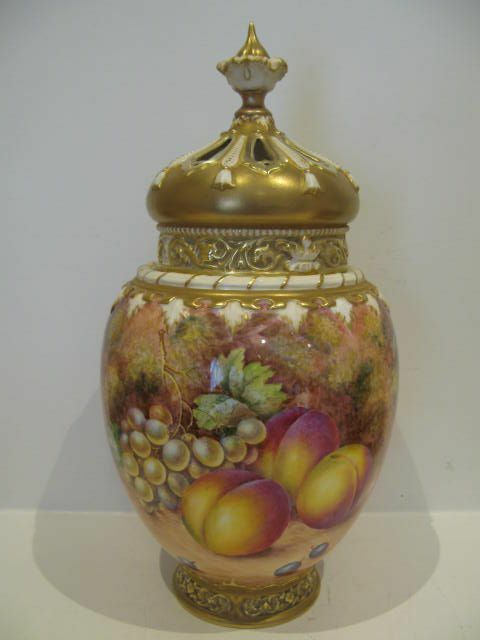 A Royal Worcester Fruit Painted Pot Pourri And Cover By N. Creed. A Royal Worcester porcelain pot pourri, cover and inner lid, shape number 1286 medium size, with well painted all-around fruit decoration by Nigel Creed. 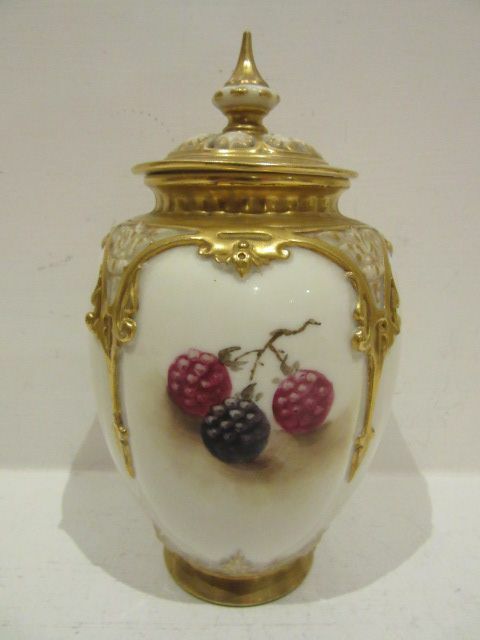 Standing approximately 10.1/2"overall height x 7.3/4" diameter, it has the black factory stamp for circa 1975/80 and is in excellent condition with no damage, crazing or restoration and the gilding is fresh and without wear. 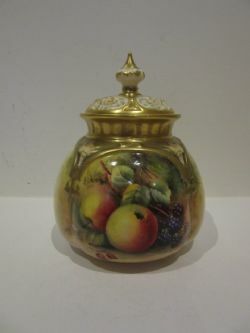 A Royal Worcester Fruit Painted Pot Pourri And Cover By R. Price. 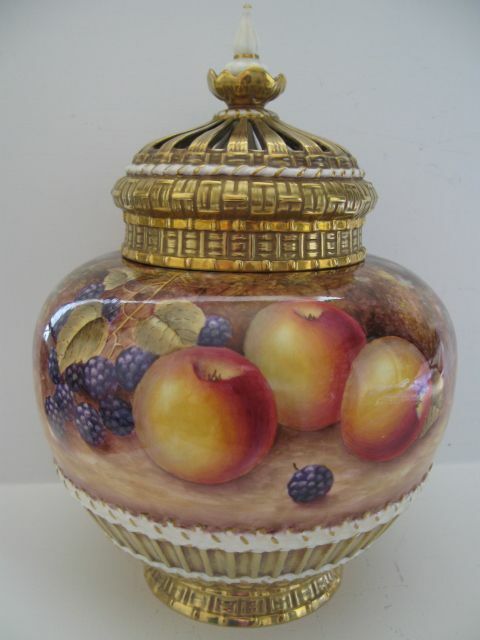 A Royal Worcester porcelain pot pourri with cover and inner lid, shape number 1286 medium size, with well painted all-around fruit decoration by Robert Price. 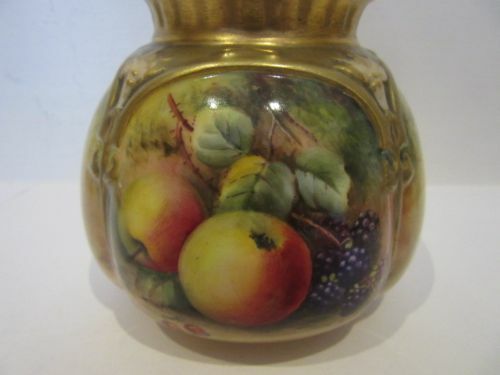 Standing approximately 10.1/2"overall height x 7.3/4"diameter, it has the black factory stamp for circa 1980/85 and is in excellent condition with no damage, crazing or restoration, and the gilding is fresh and unworn. 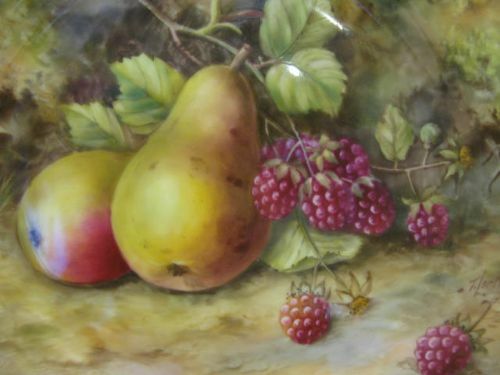 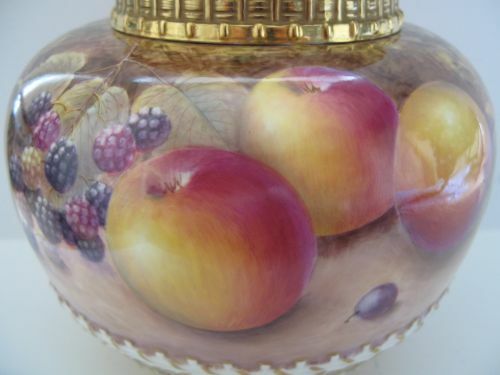 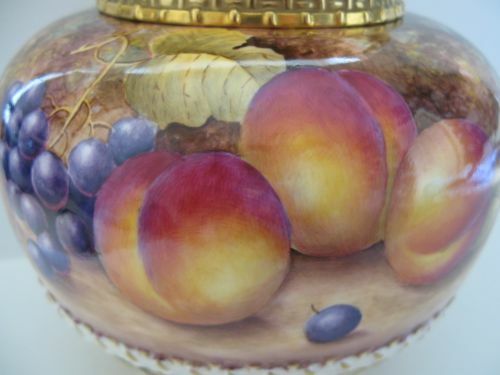 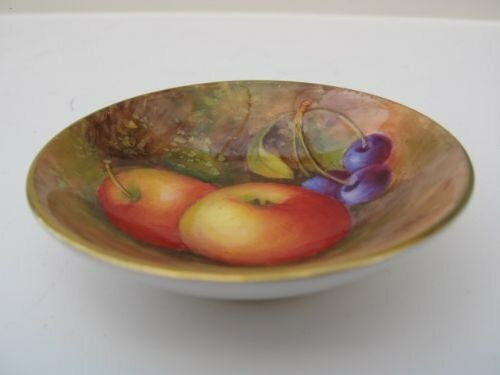 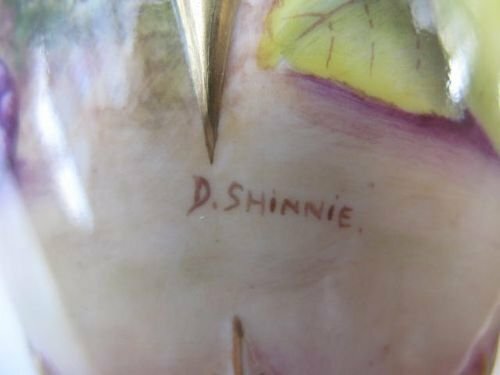 A Royal Worcester Fruit Painted Pot Pourri By D. Shinnie. 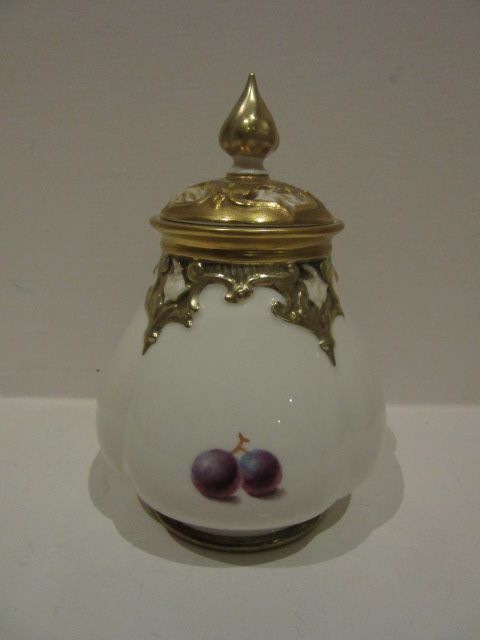 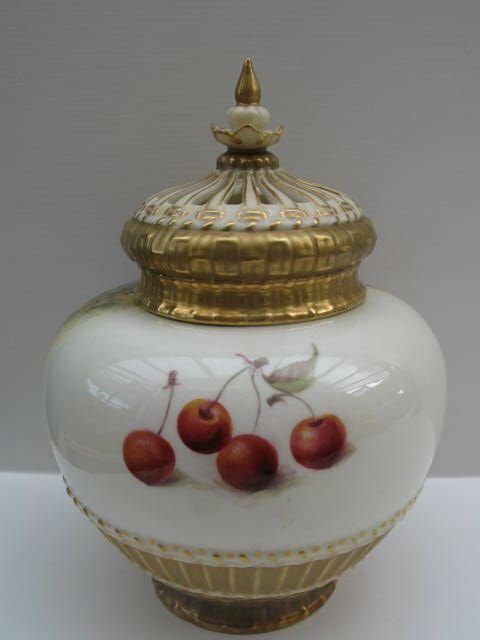 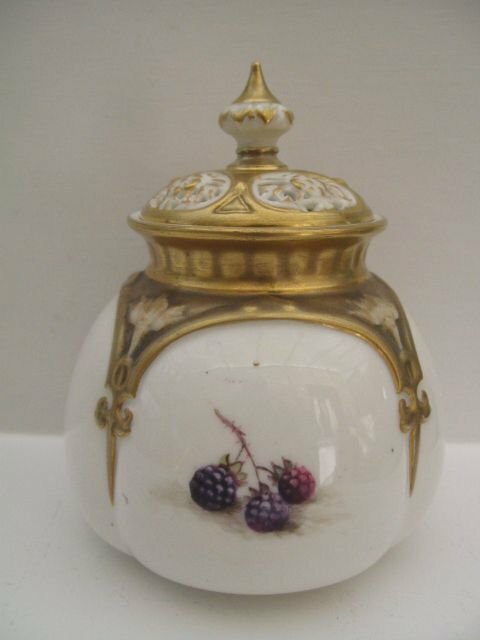 A Royal Worcester porcelain pot pourri and lid, shape number H169, with nicely painted fruit decoration by D. Shinnie. 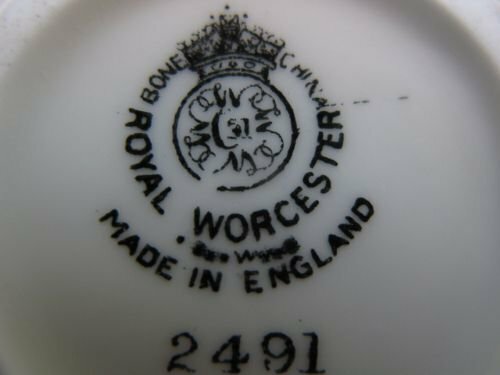 With black factory stamp for circa 1975/80 and standing approximately 6.1/4"overall height x 3.1/2" maximum diameter, it is in excellent condition with no damage, crazing or restoration, and the gilding is fresh and unworn. 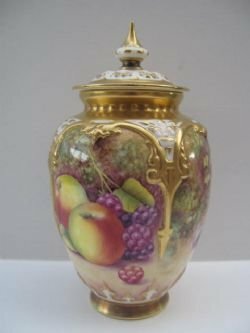 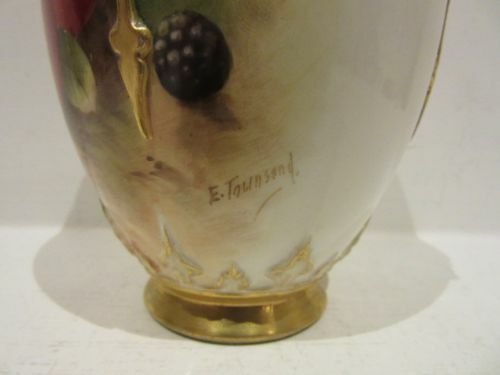 A Royal Worcester Fruit Painted Pot Pourri By E. Townsend. 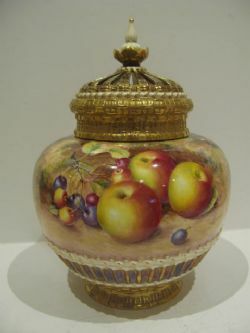 A Royal Worcester porcelain pot pourri and cover, shape number H169, with well painted apples and brambles against a mossy background by Edward Townsend. 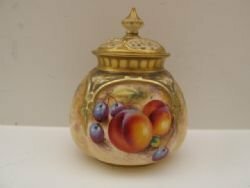 Standing approximately 6.1/4"overall height x 3.1/2"diameter, it has the puce factory stamp for 1936 and is in very good condition with no damage, crazing or restoration and the gilding is bright and shows only very slight signs of wear. 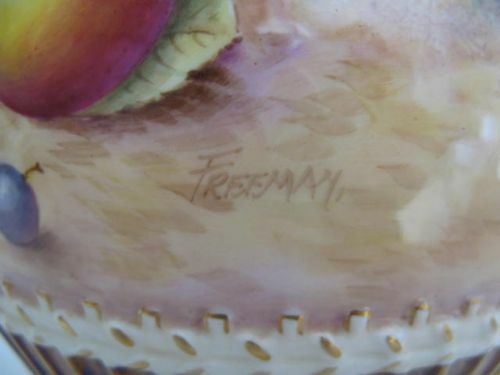 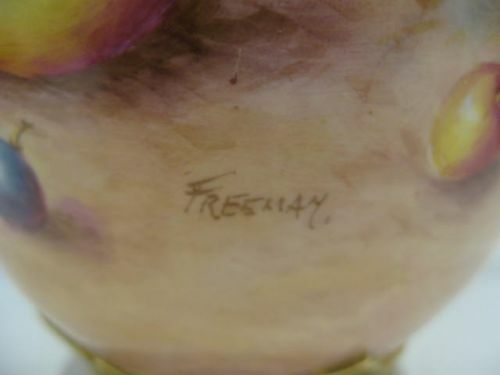 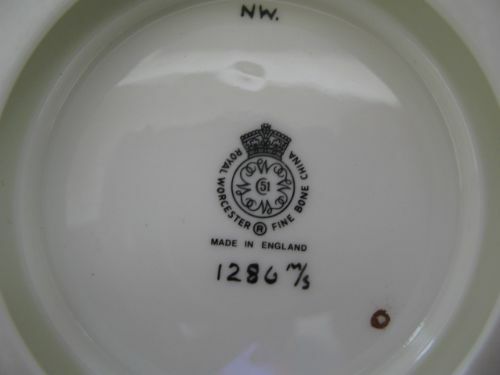 A Royal Worcester Fruit Painted Pot Pourri By Freeman. 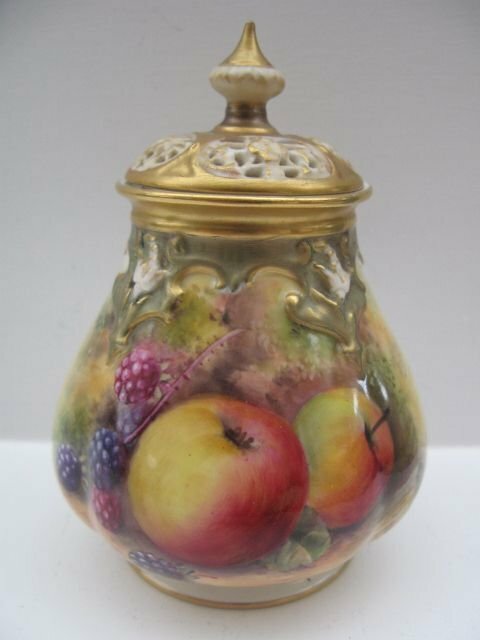 A Royal Worcester porcelain pot pourri complete with its inner and outer lids, shape number 1286 medium size, with all around painted fruit decoration by John Freeman. 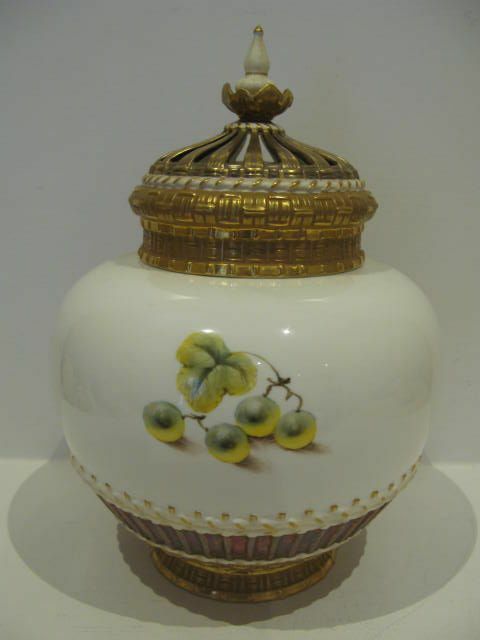 Standing approximately 10" tall x 7.1/4"diameter, it has the black factory stamp for circa 1970 and is in excellent condition with no damage, crazing or restoration, and the gilding is without losses or wear. 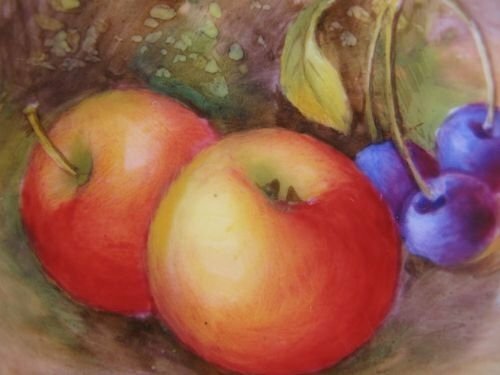 Any white patches on the fruit painted areas are only reflections. 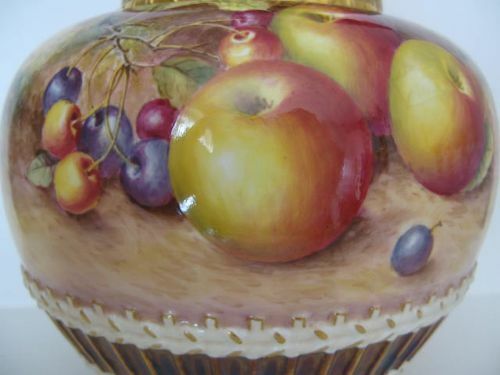 A Royal Worcester Fruit Painted Pot Pourri By J. Freeman. 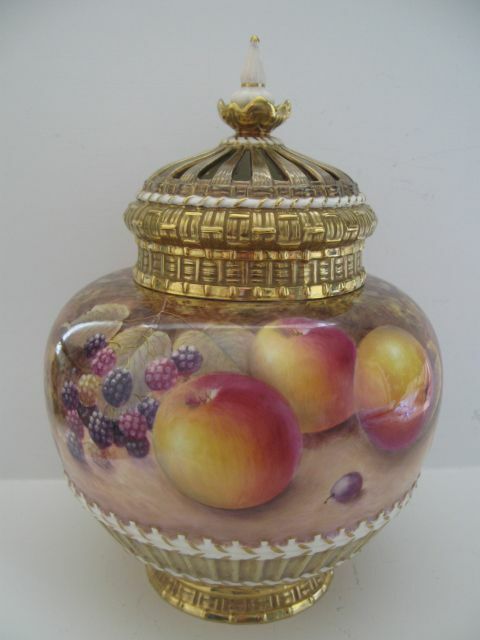 A Royal Worcester porcelain pot pourri, shape number 2048 medium size, complete with inner lid and outer "crown" lid, and with well painted all-around fruit decoration by John Freeman. 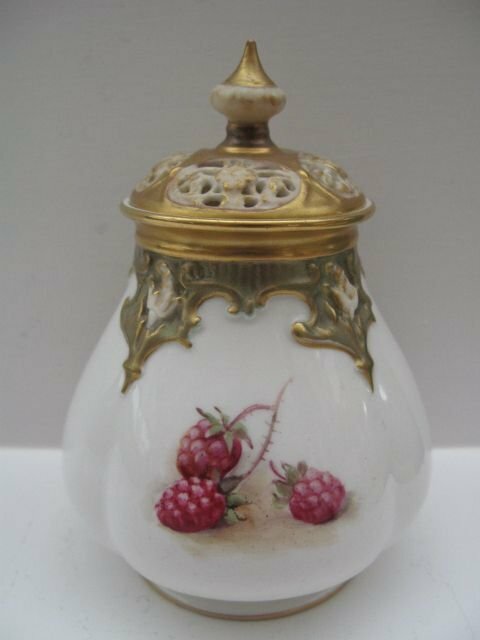 Standing an impressive 13.1/2"tall x 6.3/4"diameter, it has the black factory stamp for circa 1965 and is in good condition with no damage, crazing or restoration other than the finial of the lid has probably been re-attached, and the gilding shows only the slightest signs of wear. 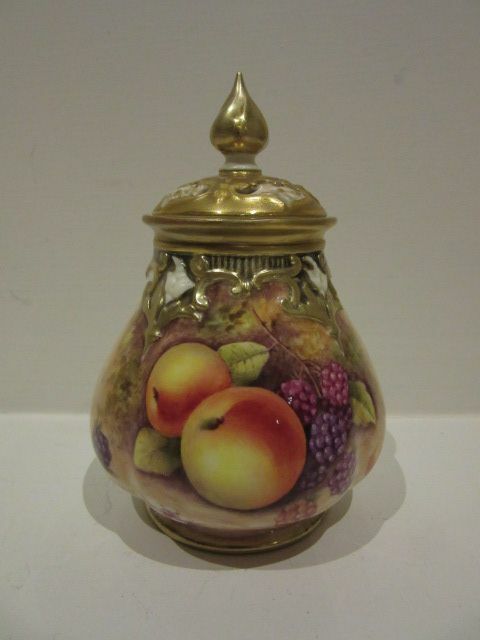 A Royal Worcester Fruit Painted Pot Pourri By J. Smith. 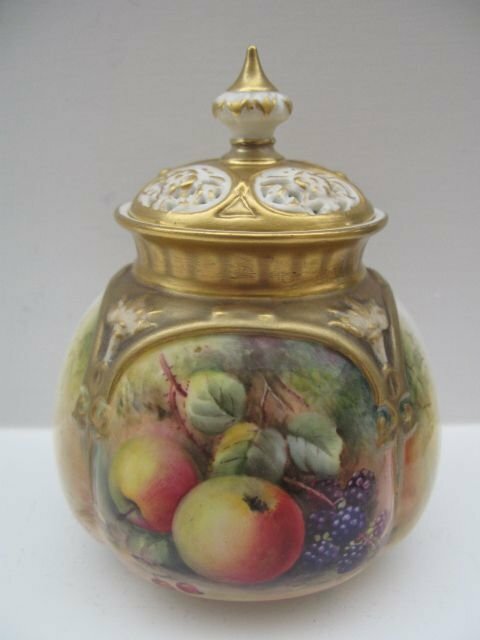 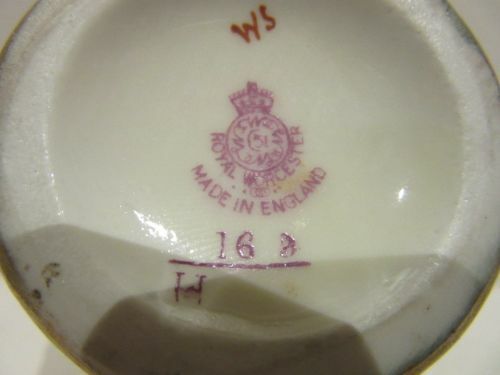 A Royal Worcester porcelain pot pourri, shape number 1286 medium size, complete with inner and outer covers and with well painted fruit decoration by John Smith. 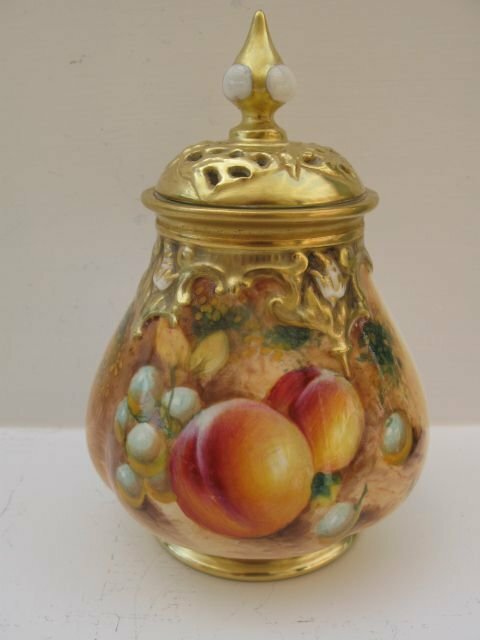 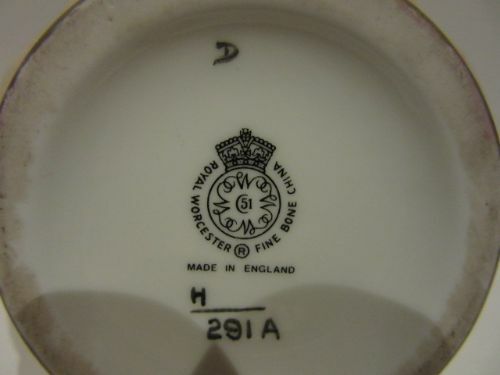 Standing approximately 10.1/4"overall height x 7.1/4" diameter, it has the black factory stamp for circa 1965/1970 and is in excellent condition with no damage, crazing or restoration and the gilding is without losses or wear. 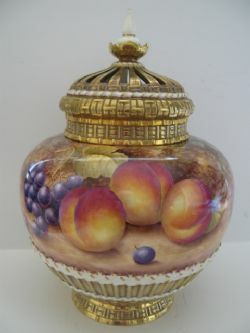 A Royal Worcester lidded porcelain pot pourri, shape number 1286, with well painted fruit decoration by Thomas Lockyer. 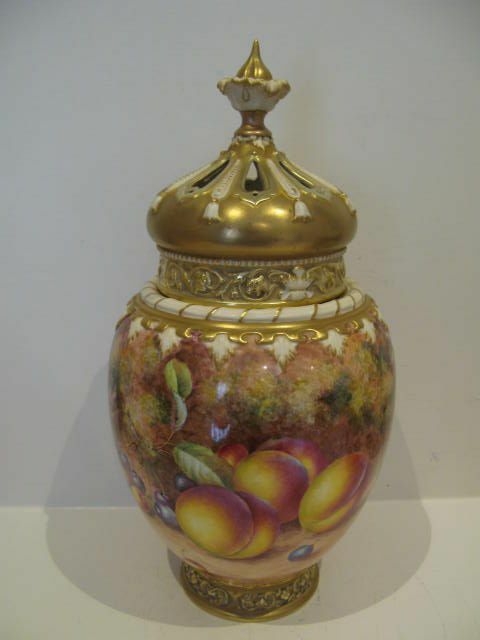 Standing approximately 8" high to the top of the finial x 5.1/2" diameter, it has the puce factory stamp for 1934 and is in very good condition with no damage, crazing or restoration, and the the gilding is excellent with only a tiny scuff mark where the lid locates. 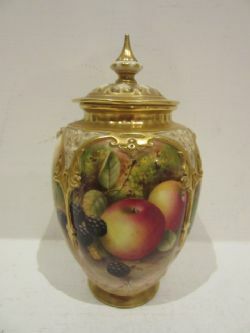 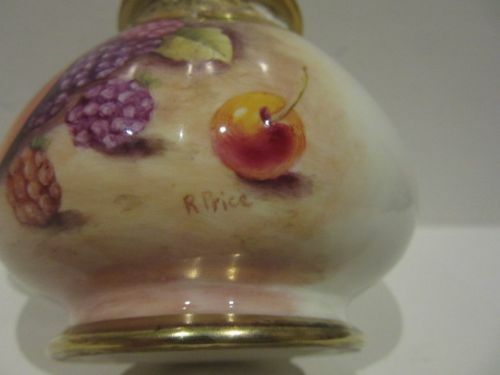 A Royal Worcester Fruit Painted Pot Pourri By R. Price. 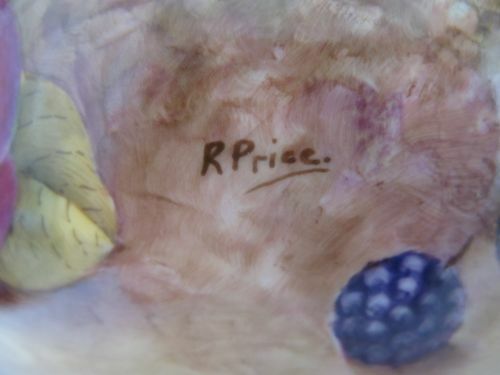 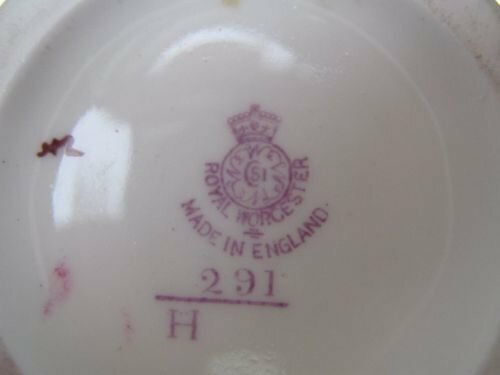 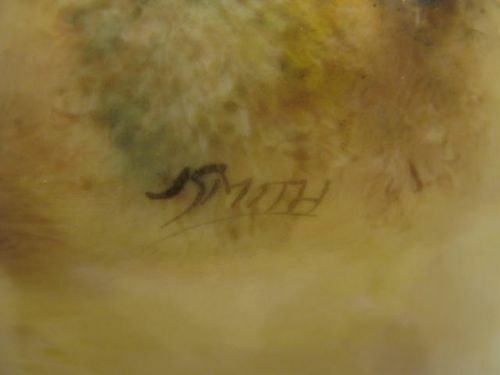 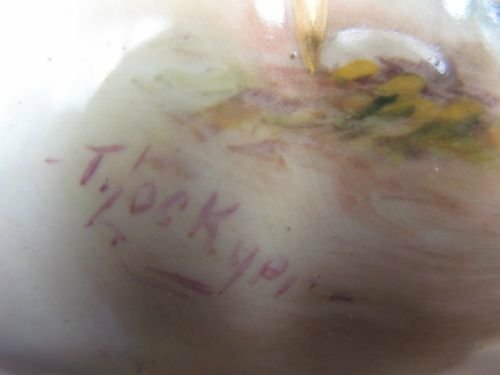 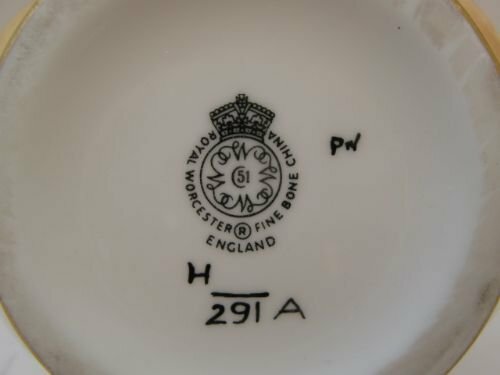 A Royal Worcester porcelain pot pourri, shape number H291A, with fruit painted decoration by R. Price. 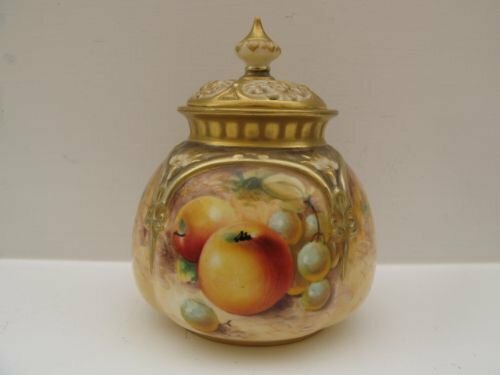 Measuring approximately 5.1/4"overall height x 3.1/2"diameter, it has the black factory stamp for circa 1975/80 and is in excellent condition with no damage, crazing or restoration and the gilding is bright and shows virtually no wear. 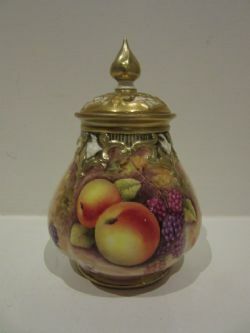 A Royal Worcester Fruit Painted Pot Pourri By Roberts. 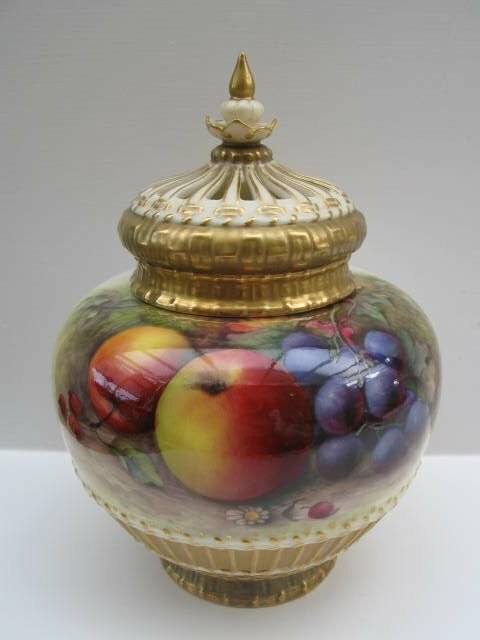 An attractively shaped, Royal Worcester porcelain pot pourri, shape number H175, with fruit painted decoration by William Roberts. 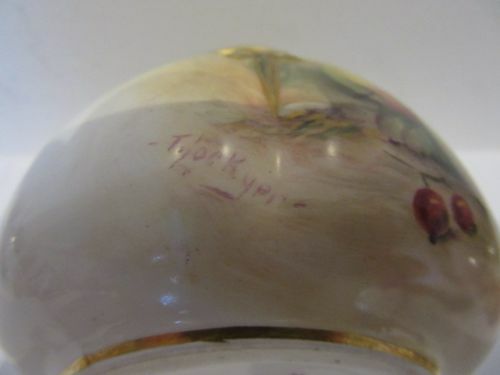 Standing approximately 4.1/2"high to the top of the finial x 3.3/4"diameter, it has the black factory stamp for circa 1975 and is in very good condition with no damage, crazing or restoration, and the gilding is unworn. 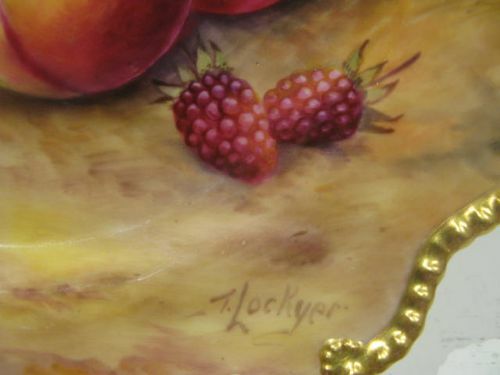 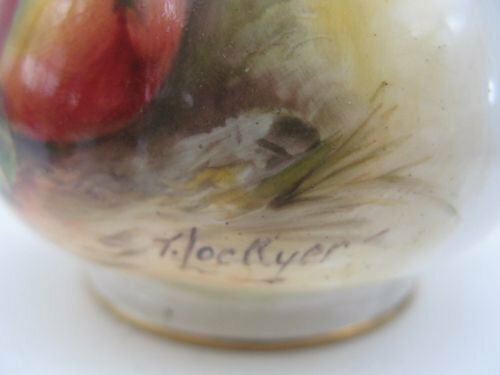 A Royal Worcester Fruit Painted Pot Pourri By T. Lockyer. 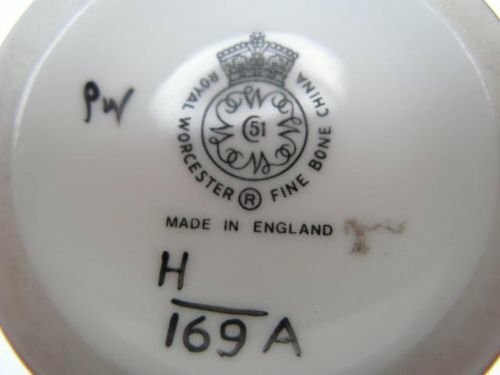 A Royal Worcester porcelain pot pourri, shape number H175, with painted fruit decoration by Thomas Lockyer. 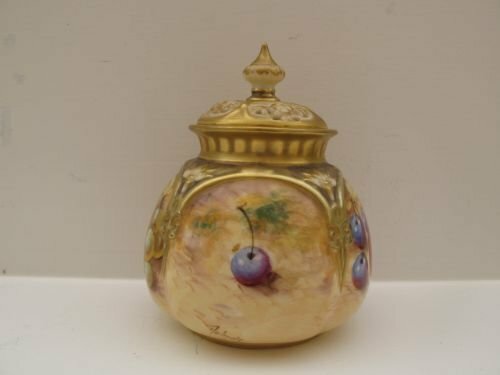 Standing approximately 4.1/2"overall height x 3.3/4"diameter, it has the puce factory stamp for 1929 and is in very good condition with no damage, crazing or restoration, with the gilding showing virtually no signs of rubbing or wear. 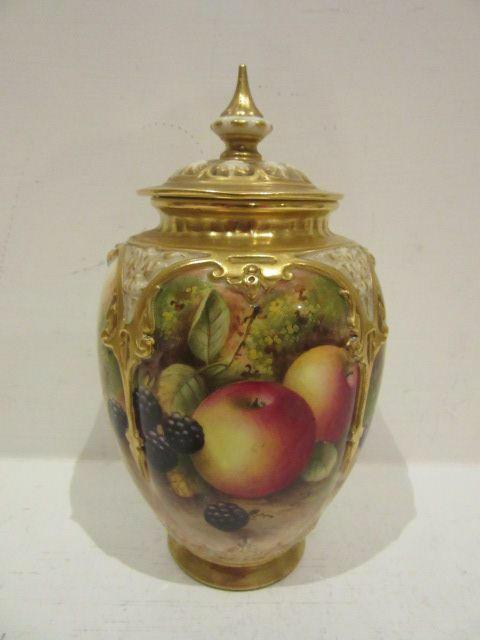 A Royal Worcester Fruit Painted Pot Pourri By Thomas Lockyer. 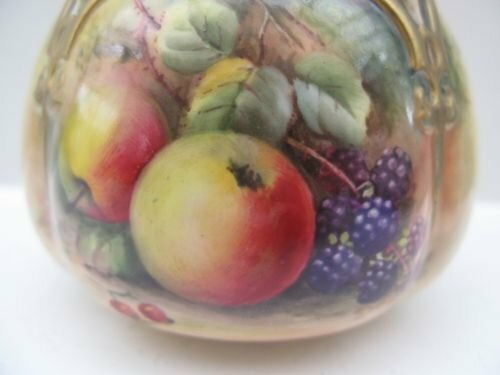 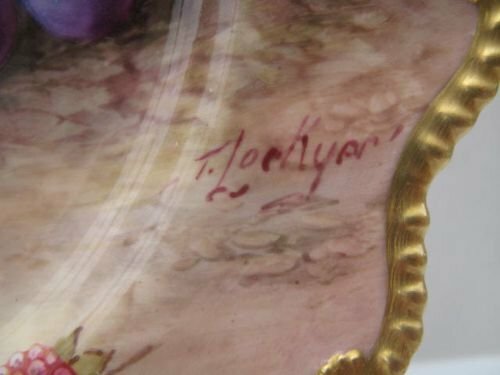 A Royal Worcester porcelain pot pourri, shape number H291, with fruit painted decoration by Thomas Lockyer. 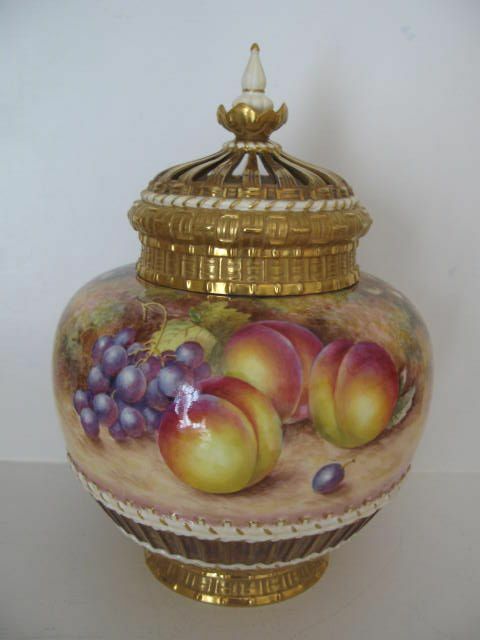 Standing approximately 5"overall height x 3.3/4"diameter, it has the puce factory stamp for 1930 and is in very good condition with no damage, crazing or restoration, and the gilding shows virtually no signs of wear. 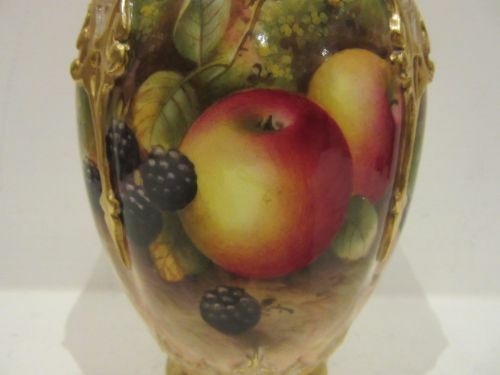 A Royal Worcester porcelain pot pourri and reticulated cover, shape number H175, the attractive 4 lobed body painted with apples, brambles and cherries against a mossy background by Thomas Lockyer. 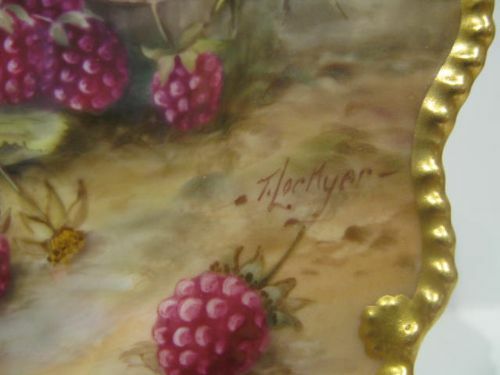 Measuring approximately 3.3/4"diameter x 4.1/2"high to the top of the cover, it has the puce factory stamp for 1929 and is in very good condition with no damage, crazing or restoration and the gilding shows virtually no signs of wear. 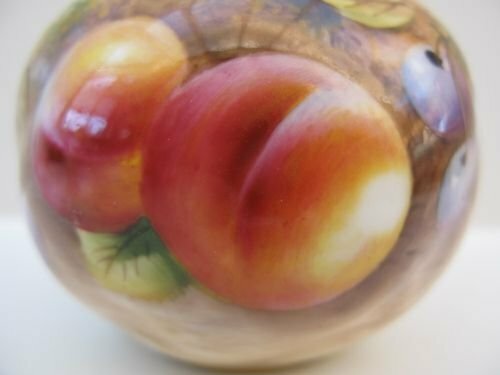 A Royal Worcester Fruit Painted Pot Pourri By W Roberts. A Royal Worcester porcelain pot pourri, shape number H291, with fruit painted decoration by William Roberts. 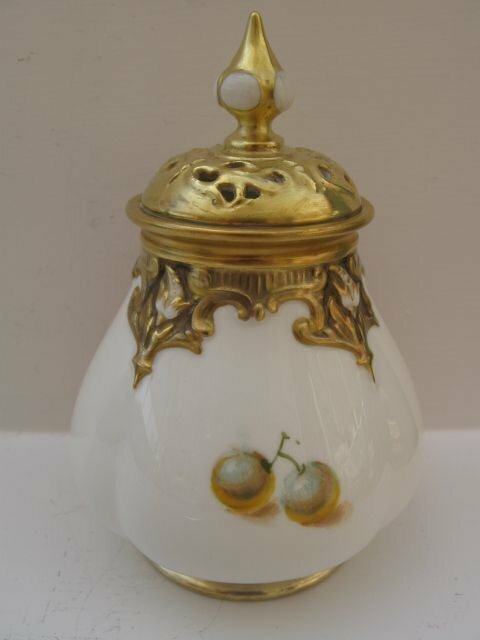 Standing approximately 5.1/4" overall height x 3.3/4"diameter, it has the black factory stamp for circa 1970 and is in excellent condition with no damage, crazing or restoration, and the gilding is fresh and unworn.